With 6 hedge fund managers -- Philip Falcone, Kenneth Griffin, John Paulson, James Simons and George Soros -- testifying before the House Committee on Oversight and Government Reform today, it might be a good time to look at how various strategies have been performing. Over at Forbes.com, former WSJ OpEd page editor -- but don't hold that against him -- Tunku Varadarajan writes a terribly amusing recap of the global monetary mayhem, titled: The Financial Crisis, From A-Z. A is for America, the big swinging Richard whose dysfunction started it all. Think also of accountability (lack of); AIG (which has cost the U.S. $140 billion, and counting--who knew insurance could be so exciting! ); assets ( what assets? ), and Adam Smith, who's slapping us about the face -- with his invisible hand. Now, this is how you close a fund! Andrew Lahde, manager of a small California hedge fund, Lahde Capital, burst into the spotlight last year after his one-year-old fund returned 866% betting on the subprime collapse. Last month, he took his ball and went home. Tired of the stress, he closed the fund. Today, Lahde passed along his "goodbye" letter (via FT Alphaville and Portfolio.com), a snarky "Up Yours" to those who do deserve it. Continue reading "Andrew Lahde: Goodbye!" 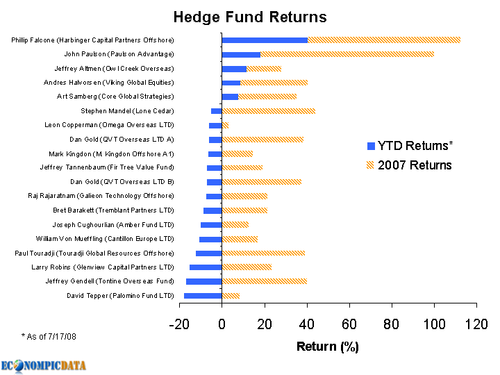 Did you get your hedge fund redemption demand in yet? The window closes today! 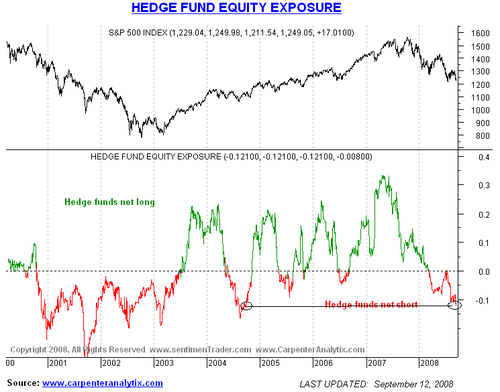 Interesting chart via Sentiment Trader: We see Hedgies are now as short as they were in 2004. I am not sure that hedgies are that short, but that's merely a low confidence anecdotal info. I'll ask Sentiment Trader where they get this data from. Is the Market Still a Future Indicator? At this point, you would have thought the Efficient Market Hypothesis would have died a quite death. But as is its wont on Wall Street, myths, bad theories, and old information linger far longer than one would expect. Investors often expect the stock market to behave like a crystal ball. Lately it has made a better rearview mirror. Conventional wisdom holds that the market efficiently reflects future corporate earnings. This makes sense, as one ostensibly buys stocks in companies to claim bucketfuls of their future profits. For decades, turns in the stock market typically led earnings by roughly six months. But during the past decade or so, stocks have moved roughly in tandem with, and occasionally lagged, the trajectory of profits, notes Tobias Levkovich, Citigroup's chief U.S. strategist. I have several favorite examples of where markets simply get it wrong. When I spoke with the reporter on this, I used the credit crunch as exhibit A. It began in August 2007 (though some had been warning about it long before that). Despite all of the obvious problems that were forthcoming, after a minor wobble, stock markets raced ahead. By October 2007, both the Dow Industrials and the S&P500 had set all time highs. So much for that discounting mechanism. We've seen that sort of extreme mispricing on a fairly regular basis. In March 2000, the market was essentially pricing stocks as if earnings didn't matter, growth could continue far above historical levels indefinitely, and value was irrelevant. How'd that work out? Three years later, the market priced tech and telecom in a similarly bizarre fashion. Some of our favorite tech and telecom names -- profitable, debt free firms -- were trading below their book value. Some were even trading below cash on hand. The market had "efficiently" priced a dollar at seventy-five cents. The most fascinating aspect of this is the opportunity for anyone int he market to identify inefficiencies. Discover where the market has a non random error -- we've called it Variant Perception over the years -- and you have a potentially enormous money making opportunity. "All of this suggests the stock market may prove less useful as a leading indicator of profits and economic growth. But it also suggests stocks are likely to get out of balance more often, creating opportunities for savvy investors." Levkovich points to the "proliferation of hedge funds" as making markets "increasingly focused on breaking news and short-term swings, rather than longer-term fundamentals." I would add the narrow niche focuses used to differentiate amongst funds and raise capital also contribute to this phenomenon. We end up with a case of the six blind men describing the elephant, with few seeing the big picture. 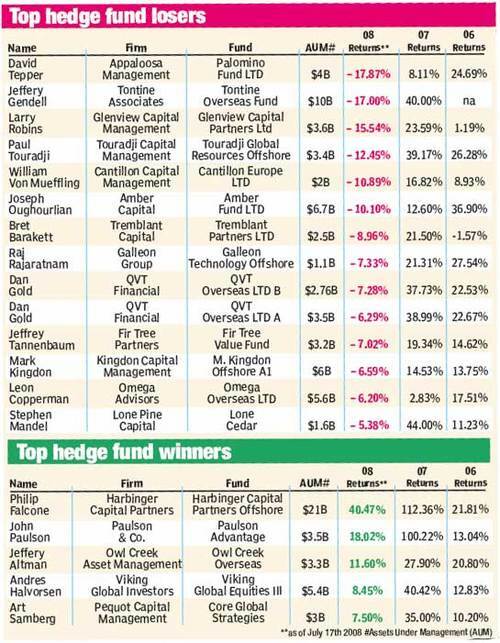 To an EMH proponent, however, hedge funds should make markets more, not less efficient. Their long lock period (when investors cannot take out cash) means they should have a longer time horizon for investment themes to play out. One of my favorite quotes on the subject comes from Yale University economist Robert Shiller. He notes the huge mistake EMH proponents have made: "Just because markets are unpredictable doesn't mean they are efficient." That false leap of logic was one of "the most remarkable errors in the history of economic thought." Just don't tell certain Traders that. They hate hearing that markets contain a high degree of random action and inefficiencies. Except for the really clever ones . . .
"John Paulson, the money manager whose wagers against the U.S. housing market helped him earn an estimated $3.7 billion last year, is now seeking to profit from Wall Street's search for capital to offset mortgage writedowns. Paulson plans to open a hedge fund by December that will invest as the world's biggest banks and brokers add to the $345 billion they've raised in the past year, according to two people with knowledge of the matter. His Paulson & Co., which oversees $33 billion, hasn't set a size target for the fund, said the people, who declined to be identified because the plans aren't final. The New York-based firm's credit funds rose as much as sixfold last year, helped by bets that rising defaults on subprime home loans would pummel the value of mortgage-backed securities. The meltdown has forced the world's biggest banks and securities firms to take $467 billion in asset write-offs and credit losses and led to the collapse of Bear Stearns Cos.
"Investors who are able to make money in a declining market and then rapidly turn around and profit from a rising market is highly unusual,'' said Thomas Whelan, president of Greenwich, Connecticut-based Greenwich Alternative Investments, which advises clients on investing in hedge funds. Paulson declined to comment. 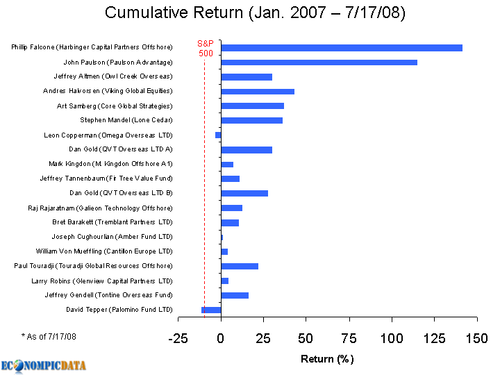 His 2007 earnings made him the highest-paid hedge-fund manager, according to Institutional Investor's Alpha magazine." Note that Paulson was early in shorting Mortgage back securities, but had the conviction and the patience to wait out the eventual sell off. I would expect something similar here . . .
Those Damn Short Sellers Are Just Killing It!